I was at least up by 8:30 this morning, but not quite ready for the day yet. After I got dressed the 3 of us had a leisurely breakfast at the main hotel building again. We headed out on foot around 10, with our first destination being the Basilica Cistern - a large underground reservoir next to the Ayasofya. After spending about an hour there, we walked over to the Grand Bazaar, a large covered market that supposedly is the most visited tourist attraction in the world. We mostly wandered through here aimlessly, though Tina did buy a nice scarf and a spinning top toy (the latter of which we later found out that she grossly overpaid for, but the kid that sold it was pretty irresistible). After leaving the Grand Bazaar we stopped for a quick lunch at a kebab stand. The only veg friendly thing they had on the menu was "cheese toast" (grilled cheese), so that's what I had. Next, we walked over to the Spice Bazaar. Tina ended up not getting anything there (she had been most interested in going), but I picked up a couple of pieces of baklavah (including chocolate baklavah, which I had never seen before) for us to share. After the Spice Bazaar we swung by Yeni Camii (New Mosque) but it was closed from tourists for prayer at the time. Instead, we walked to the nearby Eminönü port and attempted to take the tram across Galata Bridge over the Golden Horn. We failed, instead accidentally buying tokens for the ferry to the Asian side of Istanbul (I blame Joe for that one). So we decided to just walk across the bridge on the street level (but not before Tina bought some bread for a homeless kid who appeared to be mistreated by a vendor, but who then disappeared before we could give it to him - she later gave it to a homeless dad and his 2 kids). After we reached the other side of the bridge, we proceeded up the hill (the climb is no joke, though not terrible either) to Galata Tower. The fee to go to the top was 25 TL, and it thankfully included a 7-level elevator in addition to the 2 levels of stairs. The interior of the tower was more modern than I anticipated, and included a restaurant and a cafe on the top 2 floors. The narrow 360-degree balcony at the top provided some excellent views of the old city across the Horn as well as of the rest of the area in general. Next we headed back down to the Galata Bridge and this time crossed on the lower level, which houses a multitude of restaurants. Once across the bridge we headed back to Yeni Cami and this time were able to enter (after eventually finding the proper tourist entrance). I was a little surprised that Joe and I were able to enter in shorts - the attendant waved us in when we tried to signal for the wrapper that we had seen men in shorts wear at the Blue Mosque the day before. I liked the experience inside this mosque a bit better, mostly because it was far less crowded with tourists, and I don't know that I can make an objective architectural comparison of the two. 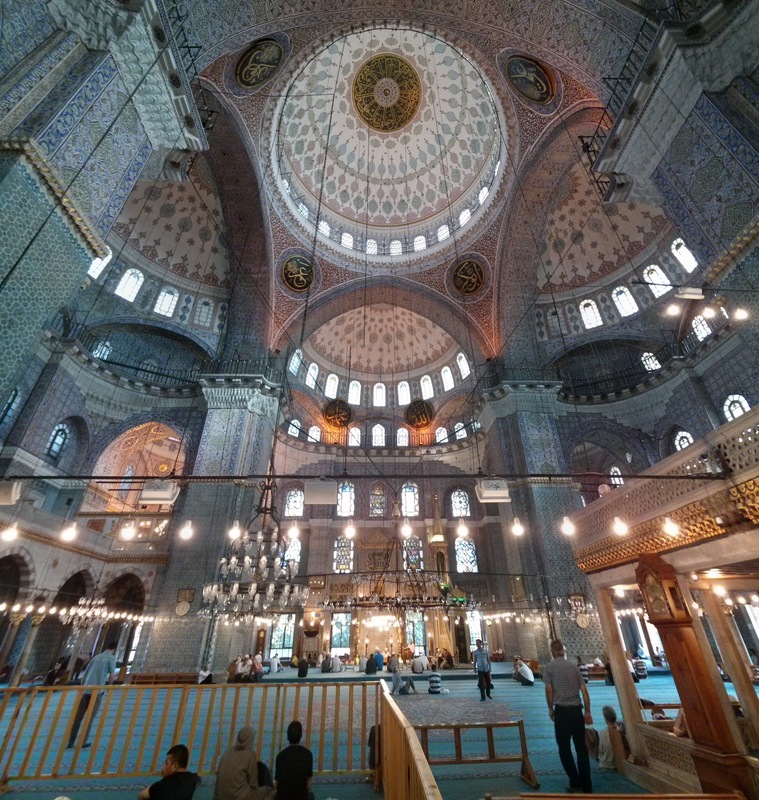 I also now wonder how the larger Sülemaniye Mosque would compare from the inside. Overall, I am a fan of the architecture of these big mosques, and I like how they are set up with a nice courtyard prior to the interior. After the mosque we made the long trek all the way back to the hotel (albeit with a couple of small side excursions), arriving there around 5:45. We decompressed for a bit in our respective rooms (including a short accidental nap on my part) before heading out to dinner at 6:30. We ate at Bella Mira Cafe & Restaurant just up the hill from our hotel and around the corner from the Blue Mosque. I had the Vegetable Mousaka, which was more of a free-form (as opposed to layered) casserole than I expected, but still quite good (perhaps the lack of a second 's' in the name makes a difference...). After dinner we walked back toward the hotel, but decided to go in search of ice cream instead. But instead of that, we found a store where Tina bought a couple of "Hammer-style" pants that she had been craving (in addition to the much cheaper spinning top toy) - one for herself, and one as a gift. We then walked back to the hotel, with a stop at a convenience store for Joe to pick up an ice cream bar. We called it a relatively early night, as we had to be ready to be picked up for the tour the next day around 8:15.